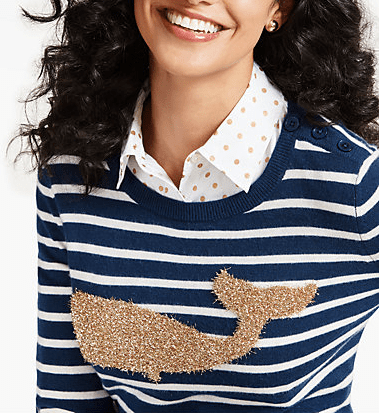 This whale stripe tinsel sweater is classic meets coastal when a tinsel-knit whale embellishes the front of a Breton-stripe sweater. The maritime-inspired motif plays up the nautical vibe with a festive dose of whimsy. Crafted from cozy lambswool blend, this naturally supple pullover features a comfortable fit for easy, trend-right layering. Why we FREAKING love it! Just enough glitter to get you in the holiday spirit and stripes to keep it casual and classic. This little sparkly diddy is ON SALE for $54!